In late July the moment came: tunnel boring machine “SUSE” (10.82 m OD) completely excavated the western tube of the Filder Tunnel in Stuttgart, Germany. Now, in a specially built cavern, the approximately 120-m long Multi-mode TBM from Herrenknecht is being disassembled into individual parts and turned around underground. In fall 2018, it is due to commence excavation in the remaining 3.4-km section of the eastern tube. 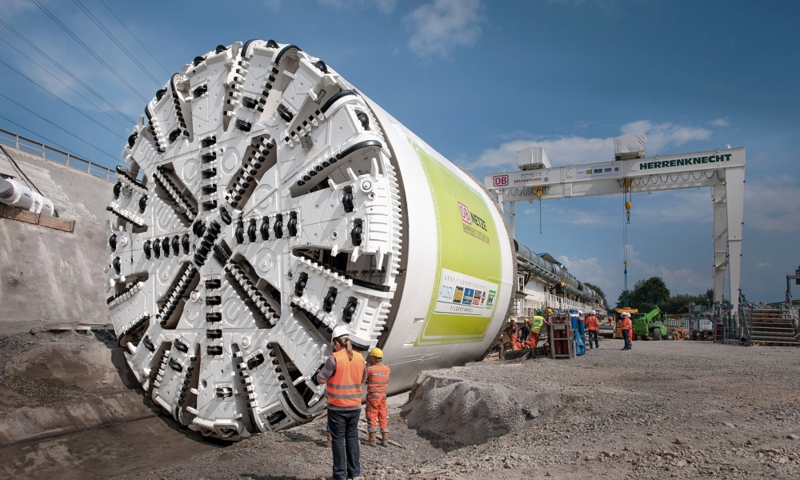 “Stuttgart-Ulm schneller erreicht” (Stuttgart-Ulm reached faster) is the acronym used to name the Herrenknecht tunnel boring machine “SUSE,” which successfully finished its third shield drive in the Baden-Württemberg state capital in late July. With the end of the advance, the crew from joint venture ARGE ATCOST 21 (Porr Bau GmbH Tunnelbau, G. Hinteregger & Söhne Baugesellschaft m.b.H., Östu-Stettin Hoch- und Tiefbau GmbH, Swietelsky Baugesellschaft m.b.H.) has now completed the western tube of the approximately 9.5-km long twin-tube Filder Tunnel. The tunnel section is located in heterogeneous rock strata and overcomes a total height difference of 155 m with a slope of up to 2.5 percent. Due to the complex project requirements, initially no mechanized tunneling was planned for the Filder Tunnel. However, the particularly flexible and convertible Multi-mode TBM machine type from Herrenknecht has convinced the client Deutsche Bahn of the advantages of mechanized tunneling over a large part of the tunnel route. In the upper section of the Filder Tunnel, the convertible Multi-mode TBM “SUSE” worked in EPB mode with screw conveyor muck removal, in the lower Filder Tunnel in open single-shield mode with belt conveyor discharge. The only area the machine was not used was in the geological transition zone, where miners removed the material from the rock using diggers and loosening blasting. The Filder Tunnel is the longest on the new line between Stuttgart and Ulm, which will link the new central railway station with the Filder Plain. As a result of the railway project, travel times between Stuttgart and Ulm will be almost halved. Around 10 million passengers per year will benefit from the scheme. Contractors working on other tunneling sections of the Stuttgart-Ulm railway project are also relying on Herrenknecht tunnel boring machines. For example, the two Herrenknecht machines “WANDA” and “Sibylle” (also 10.820 m OD) are in operation for the Albvorland Tunnel. The EPB Shield “Käthchen” (11.340 m OD) recently completed excavation of the 8.8-km long Bossler Tunnel.